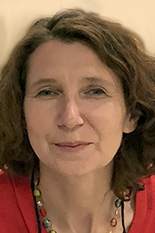 Associate Research Scientist Cornelia Fermüller has joined the Institute for Systems Research as an affiliate faculty member. Fermüller is a research faculty member with UMIACS, the University of Maryland Institute for Advanced Computer Studies. Fermüller's research focuses on computer vision, robotics and human vision. She specializes in biological-inspired solutions for active vision systems. She has modeled perception problems using tools from geometry, statistics and signal processing and developed software in the areas of multiple view geometry, motion, navigation, shape, texture, and action recognition. She also has combined computational modeling with psychophysical experiments to gain insights into human motion and low-level feature perception. Currently, she works in robot vision, specifically in integrating perception, action, and high-level reasoning to interpret human manipulation actions. The goal is to advance collaborative robots and create robots that visually learn from humans. She also has active research in motion processing for fast active robots (such as drones) using as input bio-inspired event-based sensors. Fermüller is a member of the Center for Automation Research, the Computer Vision Laboratory, and the Autonomy Robotics Cognition Laboratory.